Source: CICH graphic created using data adapted from Statistics Canada, Canadian Health Measures Survey, 2007-2009 custom runs. Bisphenol A (BPA) is a man-made chemical known for its widespread use in consumer products. 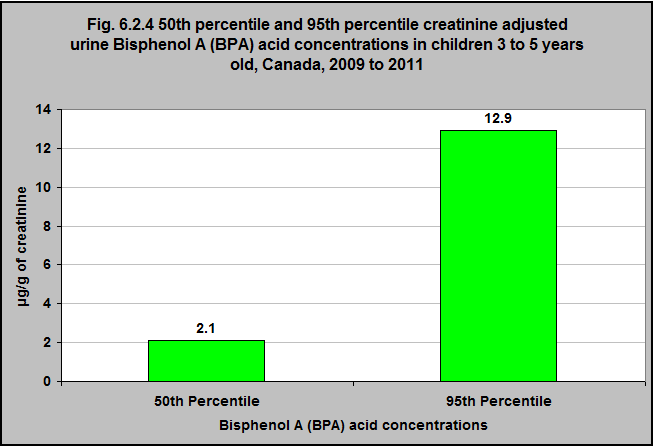 According to the Canadian Health Measures Survey, for children and youth aged 3 to 5 in Canada, the median (50th percentile) and 95th percentile blood mercury concentrations in 2009-2011 were 2.1 µg/g of creatinine and 12.9 µg/g of creatinine, respectively. Children and youth are exposed to Bisphenol A (BPA) primarily through the consumption of foods and beverages that have absorbed BPA from their packaging.2 They are also exposed to this chemical via contact with air, drinking water, soil, dust, and the use of a variety of products. There are now regulations that limit the use of BPA in some consumer products, such as infant bottles. However, BPA is still present in some products available in Canada, potentially exposing children and youth to this chemical on a regular basis. 1United States Environmental Protection Agency. (2013). America’s Children and the Environment, Third Edition. https://www.epa.gov/sites/production/files/2015-06/documents/ace3_2013.pdf – accessed March 12th, 2017. 2Health Canada. (2013). Second Report on Human Biomonitoring of Environmental Chemicals in Canada: Results of the Canadian Health Measures Survey Cycle 2 (2009-2011). http://www.hc-sc.gc.ca/ewh-semt/alt_formats/pdf/pubs/contaminants/chms-ecms-cycle2/chms-ecms-cycle2-eng.pdf – accessed March 12th, 2017. 3Braun, J.M., Kalkbrenner, A.E., Calafat, A.M., Yolton, K., Ye, X., Dietrich, K.N., & Lanphear, B.P. (2011). Impact of early-life Bisphenol A exposure on behavior and executive function in children. Pediatrics, 128, 873-882. doi:10.1542/peds.2011-1335.